I rested for a week today I am ready for longer run. I wanted to make the run easy so I was pretty slow and heart rate was well within green zone for the first 40 minutes. As usual at the end I can’t resist to speed up a bit. I normally don’t write about product/services/gadget that I’m not using. 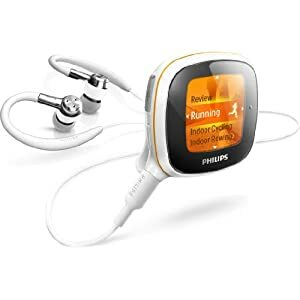 Since I bought Philips sports earphone earlier so this Philips Activa I saw in a shop drew my attention. This gadget doesn’t include heart rate monitor but I’m sure this will be included later. It works like a pedometer and a MP3 player with voice over coaching at the moment. I actually ordered this early August and received it on the second week. The magic mouse I talked about earlier has retired to a drawer. I use my MBP as a desktop with an external HP 17″ monitor and an external keyboard it’s a good match with an external trackpad like this. The key to this high score was that my stride length was smaller since I worried a bit about my right knee. It turned out that my knee was alright but right leg was a bit tired hence the smaller stride length. I discovered that at this stride length heart rate was still low at higher stride rate.